All of us that have mobiles, and at one time or another I have tried to come up with a way to keep my favorite HT from falling on the floor, or falling over, or.....well you get it. 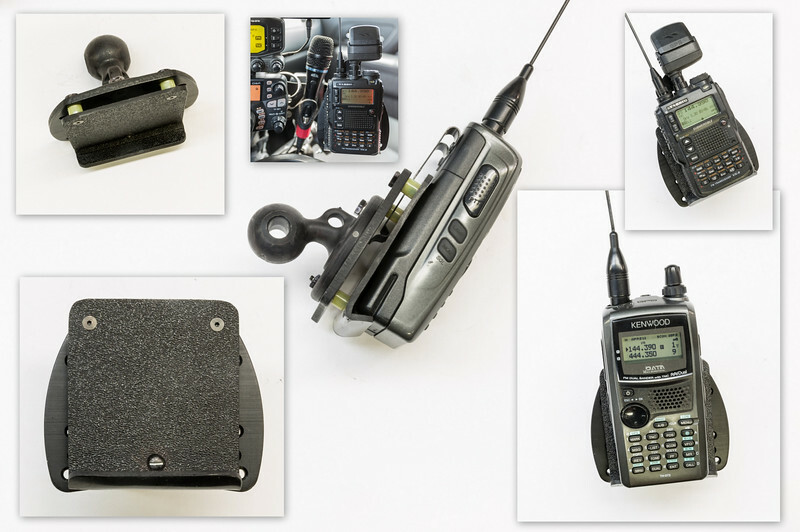 I always seemed to have the same problem with the various HT's that I own, and I decided to come up with a mount to be used with my radio stack mounted in my mobile, that would be generic in nature, allowing any one of my HT's or scanners to be secured in place simply and securely. I also wanted to be able to reach over and punch buttons and turn knobs on the HT without it moving around, and if exiting the vehicle, grabbing the HT and go. The mount as seen here allows for everything I've mentioned and more, without any complication in building It or using it. The mount consists of a front and a back panel spaced apart with spacers, allowing an HT to be clipped in place to the front panel using the belt clip on the back of any one of the HT's that I own to be put in place on the mount and stay put. Now if you decide you want to build one similar, don't be concerned about duplicating the one shown here exactly, as I allowed for a lot of flexibility in the materials you may choose or have on hand to built a similar mount. I happened to have the rear panel as seen with the ball mount attached, however you could use the same material that I used for the front panel that the HT sits on, formed from sheet ABS plastic (available at car-audio outlets, used for building audio mounts from, or a plastic supply outlet, or even material that you have on hand) with the bottom lip formed with a heat gun. that mounts on the steering wheel for working amateur radio satellites, and the thickness of the material that I used measures 1/8" (3.175 mm) in thickness, although a variation of that will work fine. Before cutting the front panel to size, I took a quick measurement of my various HT's between the top area of the belt clip and the bottom of the HT, so that the length of the panel would allow for all my HT's to be clipped in place, with the bottom of each HT allowed to sit on the bottom lip of the front panel, which keeps the HT sit squarely in place. As noted in the photo, the D72 having a longer body than the VX-8R, is supported by less of the front panel compared to how the VX-8R is supported, however the D72 is still held securely in place. The spacers that I used for my mount as seen here, are simply the ends of insulated crimp-type terminal-connectors used in 12 volt wiring applications, and the acquired length (long enough to allow inserting the belt clip attached to your HT in place) cut free, and then the 3 spacers sandwiched in between the front and rear panels (2 at the top, and 1 at the bottom, although 4 spacers will also work), and the assembly fastened together with machine-screws long enough to keep everything secure...... and its done. When its all said and done, the mount works as designed, and look great besides.